I love “Queer Eye”, plain and simple. The main reason I watch it is because it’s one of the extremely few TV shows (entertainment content, actually) where there is no violence or hate or unnecessary drama. Only fun, sweet and uplifting moments. Oh, and the ending is always positive. 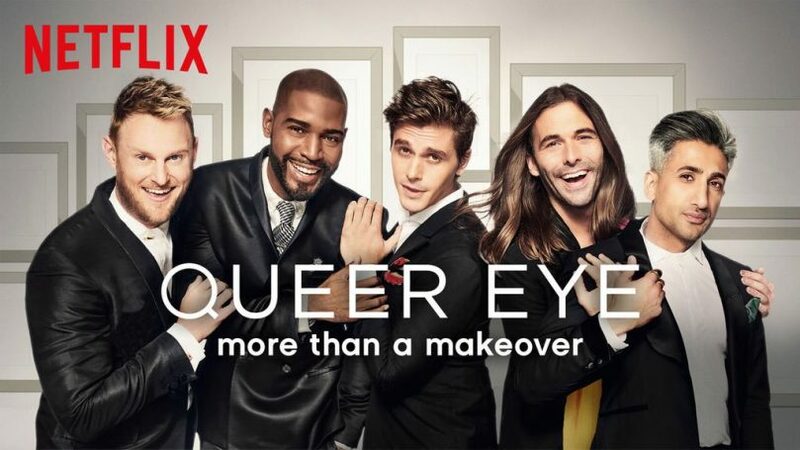 For those who don’t know, “Queer Eye” is a Netflix show (actually a re-vamp of a 2003 Bravo show) where five gay guys drastically change a person’s life in just 5 days. They come in and they do his/her house, their wardrobe and their grooming. One of the guys teaches them how to cook, whilst the fifth….well, that’s unclear, but he is mostly there for moral support. Each season is comprised of 8 different stories / episodes (one per person), and Netflix just released it’s 3rd season. Now, of course, not all episodes are great, or better say, memorable. But some are really good and I still remember them. Season 1 had some of the best, in my opinion (the country grandpa in episode 1, the tech guy, and so on), but from season 2 I only remember the transgender guy…oh, and the church lady. Season 3 is cool, and I like that they are now doing girls, too. I say this because most of seasons 1 and 2 had men featured (apparently they usually need more makeovers than women). 1. Jonathan (grooming): YAS, QUEEN! This guy is the gay-est of them all (he wears heels and fishnets, for God’s sake), but he also is (or seems to be) the most non-judgmental and nice out of all of them. He is friendly and sweet with everyone. He loves his job and he does it well (some of the best makeovers happened because of him). He is very positive and happy and you can’t help loving him (although I’m sure he must annoy some). 2. Bobby (interior design): I feel like Bobby is the most underrated, only because he is not as outgoing as the others; he doesn’t fight for the attention, like Jonathan or Karamo do. But he is a sensitive guy with a sad background (raised by very religious adoptive parents who kicked him out after he told them he has gay when he was 15-16). I also really like his interior design style: it’s clean and simple and very visually pleasing. Some say it’s too simple, but considering the makeovers these people are receiving, I don’t think it would be wise to go even crazier with the decor. 3. Tan France (fashion): Tan seems to be the most educated, rational and calm out of all of them. He was raised in Britain and he definitely has the manners. Like the other two before him, I think he does a great job at finding the right clothes for the person, and I appreciate that he tries to incorporate, not only the personal taste, but also the budget limits (the other day he shopped at H&M for a single dad with two kids). 4. Antoni (cooking): I am starting to think that Antoni was hired just because he is hot. Don’t get me wrong, he seems like a great cook (not really an expert here), but I don’t feel he contributes that much to the makeover. I say this because most of the things he “teaches” are not the simple, easy to do meals that someone needs, especially since most of the guests don’t even cook in the first place. I get he needs to prove his worth, but no need to go fancy on us, darling. Keep it simple and useful. 5. Karamo (culture): Does anyone actually know what Karamo does? I mean, I know his official title is Culture, but it’s not like he’s giving them history lessons or teaching them proper manners. I think he is mostly there for moral support and easing that person into the new life. “Opening” him/her up to change. Is he good at it? Maybe?! I don’t really know. Besides his unclear role, he’s not my favorite because he seems the most arrogant out of all of them. He is the most likely to be disgusted by a person’s kitchen or style choices and seems to be judgmental, especially about life choices. But maybe that’s just me! In conclusion, I really recommend “Queer Eye” if you need a pick me up. If you’re feeling down, watch this and it might cheer you up. Yup, I could really use a house redesign myself. Oh, and definitely a fashion makeover, my closet is a mess (I’m in a stage where I feel I have nothing to wear, or better yet, nothing I own is nice/cool enough). Check out a couple episodes and let me know!